The 14th of March or 3/14 is the π Pi (=3.14…..) Day. Even the United States House of Representatives designated March 14th as the Pi Day in 2009. This day is the geek foodie heaven day — often celebrated with all sorts of pies such as apple pie, pizza pie, shepherd’s pie . Interestingly, 3/14 is also supposed to be National Potato Chip Day. Instead of choosing pi over chips, how about celebrating the Pi Day while snacking on some potato chips? 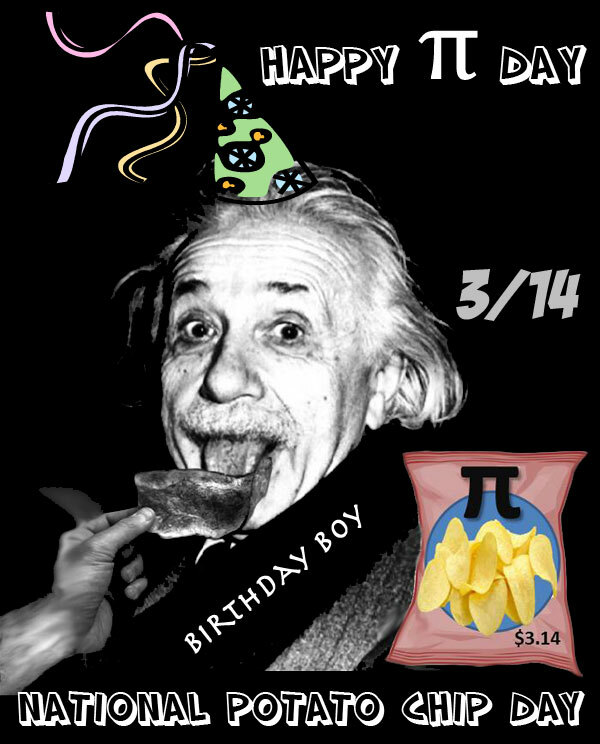 Even the birthday boy, Einstein agrees! This food comic is made possible due to photographic work of Sam Beebe and Seán A. O’Hara (the hand with the chip is made from two hands).